Maybe it’s gamesmanship on Stefan Henn’s part, a way to put some unwanted added stress on Akron, the boys’ lacrosse team everyone seems to be chasing in Class C. The evidence, though, seems to indicate the Amherst coach is speaking the truth in regard to the defending Section VI champions. Welcome to the land of the hunted, Akron. It’s your first time as the team everyone is trying to knock off. After a couple of seasons of coming up just short in the sectional final, Akron broke through with a comeback 17-15 win over Salamanca in the championship game. The Tigers graduated seven from that team. While there are new kids in fold along with seven returnees for Akron, one thing it continues to do well is find the back of the net, which has enabled it to ward off ambitious challengers. Heading into Tuesday’s Class C division game at Medina, the unbeaten Tigers, Western New York’s top-ranked team according to laxpower.com rankings, haven’t scored fewer than 21 goals in a game. They’re averaging 24.4 and came into that clash having scored a single-game school record in a 30-19 victory over Salamanca last Friday. It’s the best way to play defense, all things considered. Win the faceoff and attack, keeping the opponent on its heels, discombobulated. Of the Tigers’ returnees, two of them positively have a nose for the net. Senior Larson Sundown already has 27 goals after an All-America junior season in which he scored 73 times. He has 246 career goals. Albany-commit Chaunce Hill, who is coming off a 55-goal season, already has 20. He’s a returning All-Western New York long-pole midfielder and has 85 goals in 86 career games. Make it-take it isn’t an exaggeration as Hill’s little brother Owen, a midfielder, is one of the top faceoff men in the area who is already receiving Division I interest. Owen controls the draw with Chaunce swooping in to collect it from the wing. Chaunce Hill averages 15 groundballs per game. “He’s incredible at picking up groundballs,” seventh-year Akron coach Bryan Bellis said. Another key returnee is junior attackman Gates Abrams, who is coming off a 70-goal season and has 22 during the Tigers’ 5-0 start. Aynsley Loran-Pragle, who missed most of last season with a broken hand, has earned a starting job and has a couple big-games under his belt – including a six-goal, three-assist effort in a win over Lake Shore. Captain Alex George is in his fourth-year on the team, second-year starting, and anchors Akron’s defense. Returning goalie Frank Uebelhoer, a junior, played all but two games last year. Newcomer Geffrey Besser has 12 goals for the Tigers, who look to do something they’ve still never done: Win back-to-back Section VI championships. Earning home-field advantage will be a key, according to Bellis. Akron’s a long bus ride from most Class C destinations. It’s a whole lot easier getting to the final via Akron as opposed to having to win a semifinal game at, say, Salamanca or Silver Creek. “It’s nice to win it,” last year Bellis said. “This year the focus is to work hard, stay consistent and set up a long run. With Monsignor Martin Association power Bishop Timon-St. Jude having graduated all-world players turned current college stars Connor Fields (Albany) and Adam Dimillo (Maryland), is this the year another team takes the championship away from the Tigers? Timon is off to a 2-3 start, with the three losses coming against nonleague heavyweights, including nationally ranked Brother Rice and Culver Military Academy. The wins are a comeback overtime triumph over Canisius and a 6-4 victory over Nichols. The cupboard isn’t completely bare for Tigers as they do return goalie Tristin Dougherty, a first-team All-Western New Yorker last season who’s committed to Hobart, and Mercyhurst-commit Brandon May, an outstanding athlete and very good defenseman. The offense continues to learn on the fly for coach Mike Burke’s charges as Gavin Caufield, who will attend Division II Lake Erie, is the only senior on the attack. Sophomore Neil Gardner has shown some promise with nine goals and 11 points. St. Joe’s shares the same goal with it being the only Monsignor Martin school the past couple seasons to have beaten Timon – albeit in controversial fashion (the-overtime-goal-that-wasn’t for Timon at St. Joe’s). A key player from that win remains in the fold in junior goalie Eric Deakin as the third-year starter has already verbally committed to Le Moyne. His save percentage is around 60 percent and goals-against average is 7.1, which is pretty good considering the Marauders’ (4-4) daunting schedule has includes a 14-8 loss at Collegiate School in Richmond, the top-ranked school in Virginia, and national No. 8 Syosset (L.I. ), 18-4. St. Joe’s visits Timon under the lights at Fitzpatrick Field on Tifft Street at 7 p.m. Monday. Other key players back for the Marauders include seniors Peter Masters, who will attend Division II Lynn University in Boca Raton, Fla., Mercyhurst-commits Dominic Perna and Miles Young, and Tyler Trammell, who will go to prep school before enrolling at Hobart for 2016. Young (12 goals), Masters (nine) and Trammell have combined for 28 goals. Perna has five. St. Joe’s has nine players who will play lacrosse in college. The Marauders have another who’s already locked up the Division I dream in hockey. 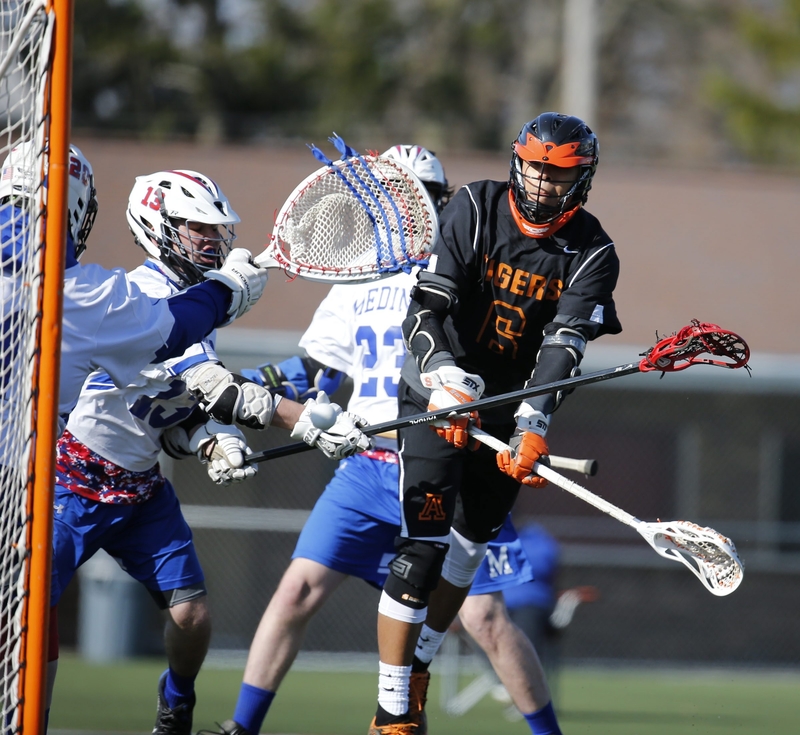 Junior Chris Berger, who has two goals and five assists, has verbally committed to Brown. Cameron Carpenter may be St. Joe’s unsung hero to this point. The backup goalie, for the good of the team, is playing long-stick midfield and “has been playing out of his mind,” according to coach Pete Hudecki. “He’s a whatever-is-best-for-the-team kind of mentality player,” Hudecki said. Don’t sleep on Canisius, which is led by three-sport athlete and Boston University-commit Jack Seminara, Billy Lafferty, Reid Martin, Jacob Lutz and Brad Pohlman. Nichols’ Jacob Parentis is another strong offensive attacker (nine goals, 14 assists), while Aaron Fanti also can finish around the net (10 goals). John Ennis leads the Vikings’ defense. Orchard Park is defending Section VI champion and still is considered the team to beat in Class A, despite Monday’s 13-9 loss to challenger Clarence. The Quakers feature 10 returnees from last year’s championship team, including leading scorer Jack Crowley, playmaker and Mercyhurst-commit Kevin McParlane and defender Matt Perla.Perla is in his third varsity season, The senior will continue his career at Division I Albany. Senior midfielder Kevin Goltz has eight goals and is receiving interest from Hobart and St. John Fisher, while Quakers teammate Ron Schul is coming off a sophomore season in which he won 60 percent of his faceoffs. Clarence has one of the top talents in Western New York in Josh Slowinski, last year’s Class A League Player of the Year. The Le Moyne-commit scored seven goals in Monday’s win at OP. He has 18 goals and 26 points. Nick Zimmerman has nine goals. Until further notice, Hamburg remains the team to beat in Class B. The Bulldogs, who have won seven of the last eight Section VI championships, reminded sectional runner-up Niagara-Wheatfield of that with a 10-2 thumping last week. That’s the same N-W (5-1) that beat Orchard Park earlier this season, just the second time in the last 13 meetings it has beaten the Quakers. That didn’t matter to Hamburg, which is 4-3 and has not lost a game to a Western New York team. Leading the way for the Bulldogs are returning starters Jim Duffy, Jason Chiodo, Evan Hollfelder, Brendan Ryan, Will Agate and goalie Jordan Kuss. N-W has seven key returnees, including All-WNY first team defender and Mercyhurst-commit James Stenzel, who’s in his fourth varsity season. Seth Ferguson is a top senior middie, while Evan Printup, Tyler Kilgour and goalie Logan Hill are back. There are 14 rookies on the 28-man roster. • Williamsville East graduated 15 from last season and coach Ed Greenway said his team is still trying to figure out its defensive combinations. Still, the Flames are off to a 3-1 start, including 2-0 in league. Senior Kyle Martinsen, who will attend Mercyhurst, has 20 goals. Senior goalie Connor Lalime will attend Bridgton Academy in Maine next year in hopes of earning a Division I or II offer. • Amherst has 10 returners from last year’s 8-10 team, including Matt Thielman, who had 57 goals, and Jimmy Chadwick (54 goals). Henn said Ben Battaglia has been the Tigers’ toughest player this season.